As far as introductions can go for this relatively new Swedish based industrial/noise project I have little to no information to provide. I mean, the title of the project Dead does share the name with the Skinny Puppy song of the same name from 1985's Bites. This project only has two releases - one is a demo titled 'Alive' and the other is the current release I'm about to type about Gnawed Bones. Information is unnecessary nonetheless as Dead Lines' debut EP is quite a smashing hit. Grime and sludge poured itself all over my body as soon as I hit the play button for 'Faceless'. Downright dark and mechanized noise purged through my speakers and unto my ears as synths from another era drowned beneath the industrial menace. The vocals are robotic and stiff but they serve well against this type of music and continued to do so for each of the five songs I listened to on the album. A remastered version of the previously mentioned 'Alive' providing more drum machines and further experimental noise. The latter of the experience almost serves as white noise among the chaos. Sci-fi noises release lasers within 'Second Tooth' as further 80s inspired analogue bliss wrought havoc. 'The Unseen' is an entirely instrumental track with very faint vocals underneath the musical destruction. The vocals, however, are so entirely digitized and distorted that they hardly count as real lyrics and more or less become another piece of the electronic mayhem. 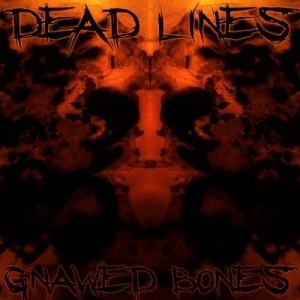 The final, crumbling song on the EP is also the title track of the album 'Gnawed Bones'. This track is spare on lyrics just like the previous, but it matters not when the retro industrial sounds are so crushing. What you see is what you get with Dead Lines; analog inspired industrial, metallic noise shrieking of despair, and clanging mechanisms of a past era are all here to play along with one another. Though these guys are even further underground than most and hardly anything has popped up on them online, I'm sure they'll gather a rather furious fanbase in no time.